Two prominent Italian researchers predict a future international mesothelioma crisis if the widespread use of toxic asbestos continues unabated. They paint a dire picture for hundreds of thousands of unsuspecting victims. Claudio Bianchi and Tommaso Bianchi, from the Center for Study of Environmental Cancer at the Hospital of Monfalcone in Italy, believe the incidence of the asbestos-related cancer will climb rapidly, despite many health organizations’ efforts to curb or ban the use of asbestos. Mesothelioma is a rare and aggressive cancer caused almost exclusively by exposure to asbestos, the naturally occurring mineral used extensively throughout the 20th century in developing countries. U.S. construction, steel and mining industries, as well as the military widely used the product. Asbestos provided an inexpensive way to strengthen and fireproof products manufactured with it. In addition to its versatility, the mineral is highly toxic. The root of their concern: Only 55 countries ban asbestos. That means an estimated 1.1 billion people, or nearly 16 percent of the world’s population, are protected from the toxic mineral. The majority of the world’s population remains at risk of exposure because government officials in their countries have curbed the use of asbestos or refused to ban the substance. Also, many of those countries do not keep a registry of mesothelioma cases. Those that do, often underestimate the incidence among their populations. The World Health Organization (WHO) currently estimates that 100,000 people die annually from an asbestos-related disease. According to the Minerals Yearbook of the U.S. Geological Survey, 1.9 million tons of asbestos were mined for commercial use in 2013, the last year statistics are available. 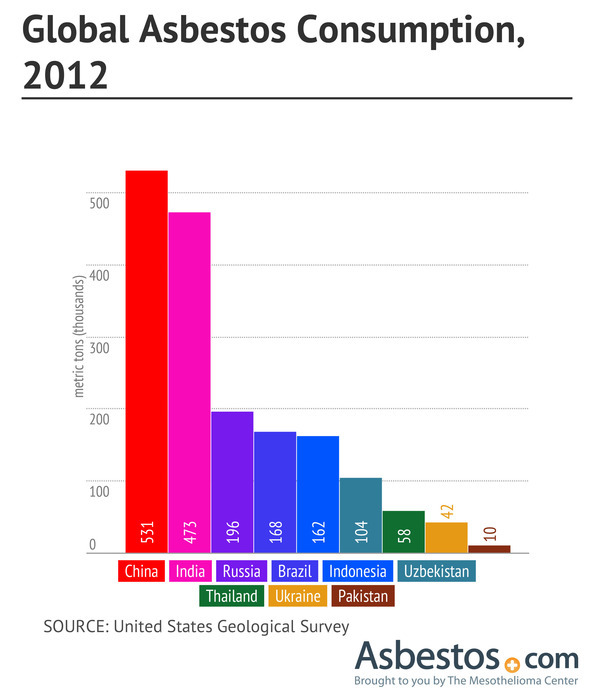 Russia mined 1 million tons of asbestos and ranks as the world’s biggest producer. Developing countries throughout Africa, Asia and South America use it extensively now, much like Europe and North America did in the 20th century before significantly reducing its use in recent decades. Manufacturing industries in many countries ignore the dangers of asbestos in order to create affordable, mass-produced building materials that contain the deadly substance. None of the top consumers of asbestos are among the countries in the study reporting the most cases of mesothelioma today. There has been little reliable documentation of mesothelioma done there. 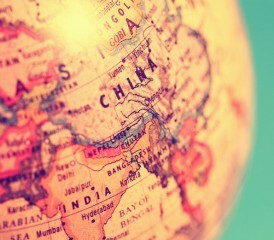 For example, only 13 percent of the population in China is covered by its cancer registry. In India, only 7 percent of the population is covered. In Thailand, only sporadic cases of mesothelioma are reported, even though large numbers are suspected. The authors believe that some of these countries have grossly underestimated diagnosis and deaths from mesothelioma. Asbestos was used liberally in the shipbuilding industry throughout the 20th century because of its ability to fireproof vessels. The highest mesothelioma incidence rates among men reported in the study were from the U.K., Australia, The Netherlands, New Zealand and Malta. Their rates mostly have remained steady in the past 15 years, showing few signs of decline. The U.K. reported 3.4 cases per 100,000 people. Australia was at 3.2 per 100,000. The U.S. reported 1.9 per 100,000. Although asbestos use in these countries has dropped significantly, they still are feeling the effects of mesothelioma because of the long latency period (10-50 years) between exposure and diagnosis.